January 6, 2019 begins the Epiphany season on the traditional church calendar. Here are some of our most popular posts to help you celebrate the visit of the Magi to baby Jesus. It is somewhat unfortunate that in modern culture Christmas “ends” once the gifts are unwrapped on the 25th. Technically, though, that is only the beginning of the traditional Christmas season in some church calendars, and many people around the world celebrate Christ on Epiphany, which comes twelve days after Christmas itself. There is no reason not to recognize, observe, and honor this holiday, which commemorates the visitation of the Wise Men and their gifts to Jesus. For us, Epiphany is also a reminder that Jesus was revealed to Gentiles and celebrated by all types of people. And the story of the Wise Men encourages us to never stop seeking what matters. 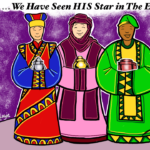 It might be fun to have an “epiphany party” to celebrate this day of three kings, or at least honor it with a special Sunday school lesson. At the center, focus on the story of the Wise Men following the star to Jesus (found in Matthew 2). Emphasize how the men journeyed long and far to find the Christ child. They were intellectual people and had studied the scriptures and skies to learn of the coming Messiah. They risked a lot, trusted a lot, and sacrificed a lot for just a glimpse of Jesus. Shouldn’t we be just as eager to devote our lives to finding Him? It is also significant to note that these Magi were not Jews. They were foreigners. But as with the shepherds, God chose less likely recipients to hear and respond to the news of Jesus. We celebrate how the wise men obeyed God’s call, even if they did not know that’s quite what they were doing! In Spain and Mexico, “El Día de los Reyes” (Day of the Kings) is celebrated with gift-giving and parties. Often special pastries are served, including special cakes with prizes inside. Consider making such a treat and hiding something inside. The person who finds it is “king” for the day. In many Latin American countries, children leave out hay and food for “camels” rather than cookies for Santa, and put their shoes outside to be filled with gifts. For younger students, have them put a shoe out and have an assistant fill with candy. Decorate crowns to recall the three “kings.” Make special cards or presents for a shut-in or someone in the church who needs a little encouragement. In Poland and Belgium (just to name a couple), children go door to door singing and receive things, sort of a cross between trick-or-treating and caroling. Celebrate with some songs and maybe even belated caroling of your own. Have a classroom “hot and cold hunt” in honor of seeking something. Hide a star-shaped object or a tiny baby doll, and have kids look for it. In Italy, the legend of “La Befana” is told. Share with students this tale of a woman who was too busy to accompany the wise men and missed meeting Jesus. Discuss how we sometimes do the same thing ourselves, and how we can keep hearts and eyes open for Him. Whatever else you do and however you celebrate, never forget the guiding rules of any quality lesson or activity: keep things simple, keep things fun, and keep things Christ-centered!